Fungus is a wood attacking organism that consumes wood and other organic matter. Moisture in wood can cause the growth of fungi that causes rot and wood decay. This type of wood-destroying fungi is called rot fungi or decay fungi. 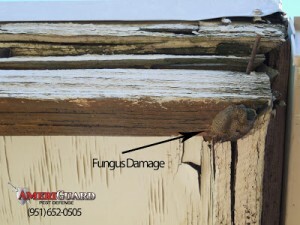 Fungus or dry rot produce threads through damp wood, using the wood as a food source. The visible body of the fungus grows on the outside of the wood. This fungus growth creates millions of spores (seeds) that are transmitted through the air and soil. In your home, bathrooms, kitchens, drains or other leaks left unfixed will create excess moisture conditions, causing significant wood damage. Other wood members of the home can be damaged by excessive moisture such as rain, sprinkler systems or other moisture contributors. 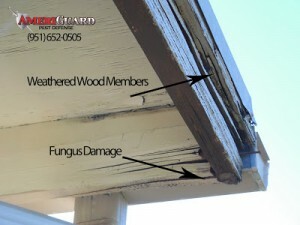 To minimize dry rot and fungus, it is important to keep your roof in prime condition and keep all exterior wood primed, painted and properly caulked. White Rot gives wood a bleached white appearance and decreases the strength of the wood until it turns spongy and stringy. Brown Rot turns wood brown and breaks it into brown cube-like pieces with cracks running perpendicular to the grain of the wood. Brown rot is a major cause of structural wood decay and threatens the structural integrity of the affected wood. Water should drain away from the structure through efficient grading and proper roof overhand. Rain gutters, downspouts and drain tile should move water away from foundation walls. Condensation from air conditioners should be properly drained. Ensure proper ventilation in subareas and crawl spaces. These environments should have adequate vapor barriers.